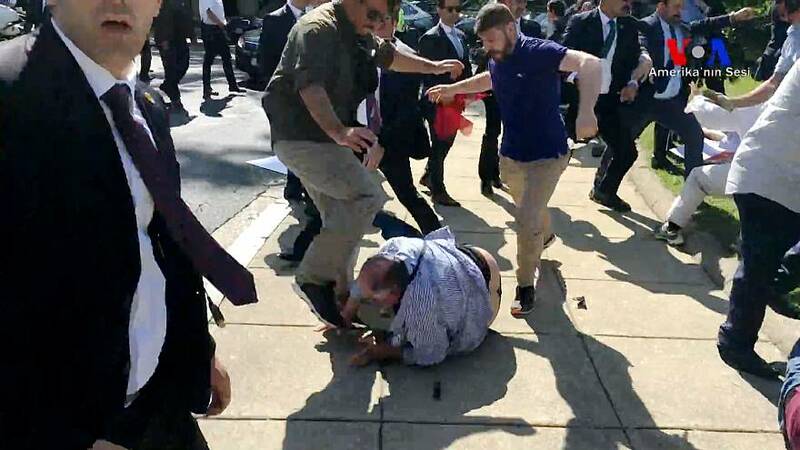 The two Americans involved in a shocking brawl outside the Turkish embassy in Washington in the spring pleaded guilty on Thursday to felony assault charges, the Justice Department said. Sinan Narin, 45, and Eyup Yildirim, 50, each pleaded guilty in the Superior Court of the District of Columbia to one count of assault with significant bodily injury, Justice Department spokesman Bill Miller said in a statement. Narin and Yildirim were among the men caught on camera brushing past U.S. law enforcement and pummeling protesters with fists and feet. The melee came just after President Donald Trump hosted Turkish President Recep Tayyip Erdogan at the White House on May 16. Narin, of Virginia, and Yildirim, of New Jersey, have been in custody since their arrests in June. They are slated to be sentenced in March, according to the Justice Department. The Turkish government has blamed the violence on the protesters, whom they allege were linked with the PKK, a group the U.S. State Department considers a foreign terrorist organization. At the time of the melee, D.C. Police Chief Peter Newsham said there was no indication the protesters were part of a terror group. In addition to the two Americans, a dozen members of Erdogan's security detail — nine security officers, three police officers — as well as two Canadians have been charged with taking part in the scuffle, according to law enforcement officials. Erdogan has been accused of cracking down on political opponents and journalists after a coup attempt last year. In one video recorded during the brawl, the Turkish leader can be seen looking on as his security guards, many of them dressed in suits, clashed with the protesters. U.S. officials and lawmakers from both parties have condemned the Turkish government for the diplomatic donnybrook.